Disney and Electronic Arts today announced a partnership that will see Star Wars games developed and published on all platforms over multiple years. “Under the agreement, EA will develop and publish new Star Wars titles for a core gaming audience, spanning all interactive platforms and the most popular game genres, while Disney will retain certain rights to develop new titles within the mobile, social, tablet and online game categories,” reads a press release delivered this afternoon. EA Labels president Frank Gibeau further added that three of EA’s studios will work on Star Wars games going forward: Battlefield developers DICE and Dead Space creators Visceral games will develop brand new Star Wars games while BioWare “continues to develop for the Star Wars franchise.” It’s unclear whether that means simply more work on last year’s MMO Star Wars: The Old Republic, or that BioWare has other, unannounced Star Wars games in the works. 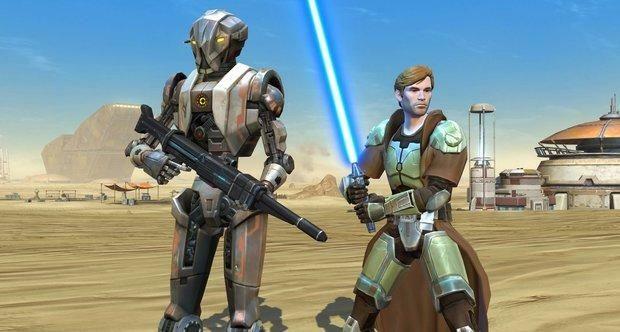 The future of Star Wars seemed bright when Disney purchased Lucasfilm in 2012, but some fans’ hopes were dashed when Disney closed the Star Wars game development studio LucasArts last month. That left highly anticipated in-progress LucasArts games, in particular the underworld-set third-person shooter Star Wars 1313, up in the air, where they remain to this day. While it would seem in Disney’s best interest to attempt to resuscitate the game’s development with the help of EA, the companies’ exact plans have not yet been announced. We reached out to Lucasfilm and received the following comment in response, along with this link to StarWars.com’s coverage of the news.